The beautiful Giant’s Causeway captivates thousands of Northern Ireland visitors to the Causeway Coast each year. Its uneven, hexagon-shaped rocks form into mounds and extend from land to sea. 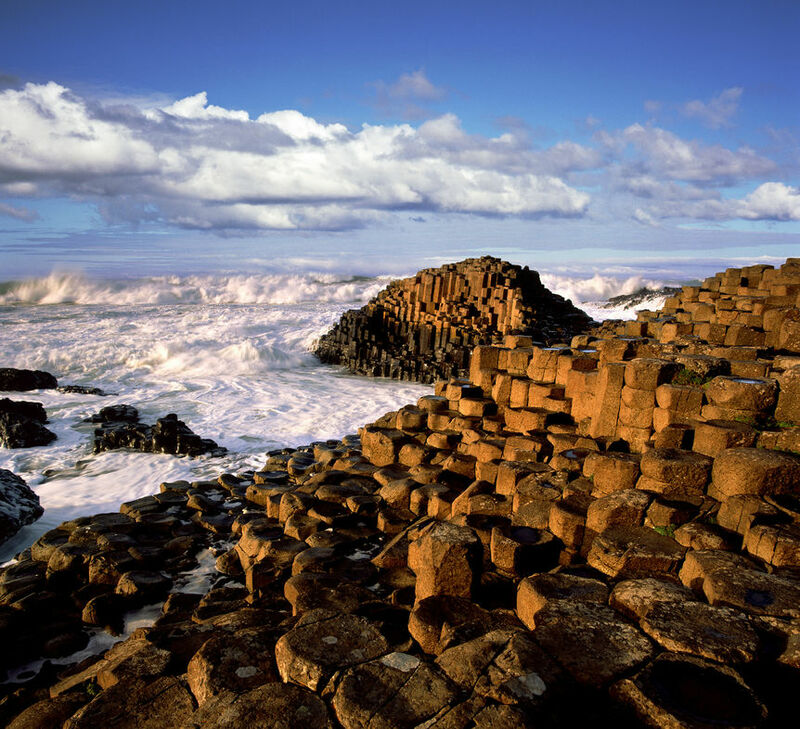 Quite extraordinarily, 40,000 basalt columns make up this “must-see” Northern Ireland attraction. With breathtaking scenery at every angle, the legend behind its creation is just as compelling. As the story goes, Finn MacCool (also referred to as Fionn MacCumhaill) was a giant and soldier who once lived on the North Antrim coast. One morning, Finn was gazing out across the Irish Sea to Staffa, Scotland where his enemy Benandonner resided. The two were competing neck and neck for the affection of a giantess who also lived on Staffa. Back and forth the two would shout; challenging each other to fight. Any physical brawl was hard to achieve, however, as no boat was strong enough to carry the weight of either giant across the Irish sea. Finally, Finn decided he’d had enough and planned to build a bridge to take him from Ireland to Staffa. After six days of non-stop work, he finished the job and fell fast asleep on the bridge. Finn awoke to the loud, threatening sound of Benandonner’s footsteps beginning to cross from Staffa. He quickly grew afraid at their sound and raced home to his wife Oonagh. Soothing him, she wrapped him up in blankets as though he were an infant and left him to fall asleep. Once Benandonner arrived at Finn’s home, Oonagh told him her husband would be back shortly and he could wait by the “sleeping infant” in the other room. At first sight of the sleeping Finn, whom Benandonner thought was Finn’s baby, Benandonner was in fearful shock. If this was the size of Finn’s offspring, Benandonner could only imagine how big and frightening Finn, himself, was.Terrified, Benandonner ran back home; destroying most of the bridge along his way. Legend has it the remaining rocks and mounds are the formation of Giant’s Causeway. Today, visitors and locals alike stand and gaze into the Irish Sea in attempts to retrace the footsteps of giants.